According to a study done by the Department of Exercise Science at the University of Georgia, exercising for just 20 minutes can help with information processing and memory functions. By taking a brisk walk for roughly one hour, twice a week, you’ll get your heart pumping for 120 minutes of the week. Think of the brain power. Morning workouts not only spike brain activity and prepares you for whatever work throws at you that day - they also help retain new information and instigate a more positive reaction to complex situations. If you can’t fit in a morning workout - any exercise is better than none. Remember, anything that is good for your heart is brilliant for your brain. Research shows that exercising four hours after learning something new helps you retain the information learned for the long-term. However, the same effect wasn’t found if the workout was done immediately after learning something. It’s thought to have something to do with the release of catecholamines, which are chemicals known to improve memory consolidation - but the exact reason for this memory retention is still not known precisely. As well as helping you lose weight, stay flexible, diminish stress and make friends, dance is one of the best workouts for the brain. 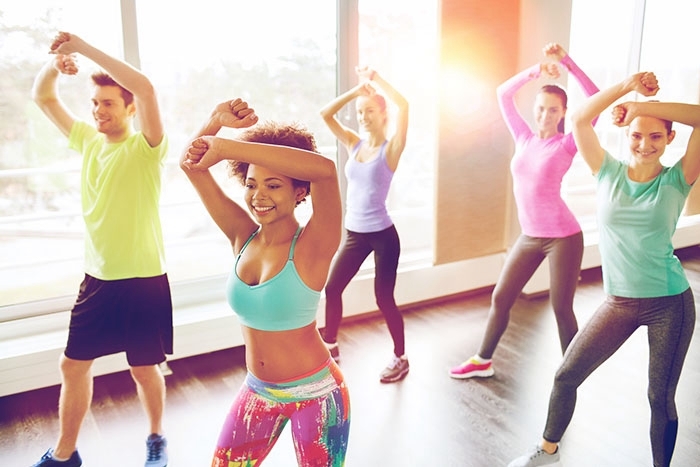 From swing to Zumba, workouts that incorporate coordination rhythm and strategy alongside cardio can boost your memory and prevent the onset of dementia as you get older. It does this by reversing the volume loss in the hippocampus, the section of the brain that’s in charge of memory. Learning dance moves is both physically and mentally demanding, so dancers are constantly maximise brain functions by memorising and running through steps in dance routines. Heading to the gym alone? Plan a circuit workout. By mixing up activities, you’ll keep your heart rate spiked while constantly redirecting your attention to deal with different physical and mental demands. If you don’t have time for a proper workout and are feeling a little exhausted, try a few star jumps to get your blood pumping and your brain into gear.